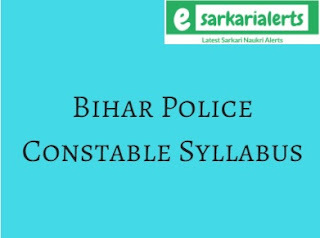 Are you in the search of Bihar Police Constable Syllabus 2017? If it is then you have reached to a correct web page. The Bihar Central Selection Board of Constable has successfully uploaded the syllabus and exam pattern of the upcoming Bihar Constable Examination on its official website. Many job hunters are enrolled for this job examination and after applying for the same, they are looking here and there for the syllabus and exam pattern because they want to get success in this examination which is going to be conducted for 9900 vacancies of Constables in the organization. In the preparation of any exam, syllabus plays an important role because if you don’t know that what kind of questions will be asked in the exam then you will not be able to crack this examination. Therefore, we suggest you to check the complete syllabus and pattern of this exam with the help of this page and afterward, start your preparation for the upcoming written examination because if you don’t qualify the written test, you will not be able to appear for the next round of the selection process which is Physical Test. The qualifying process for the next round is well-furnished in this article. Earlier, the Bihar Central Selection Board of Constable had revealed an authorized job advertisement on its website. According to this notification, online applications were invited from those job hunters who were eligible to apply for the 9900 vacancies of the constable in the organization. The job hunters who were seeking a Police Job in the Government Sector they have enrolled themselves for this notification. Now, the authority will conduct a written test after the completion of registrations. Let’s talk about the Bihar Police Constable Exam Pattern 2017. The questions in this examination will be asked in the objective type. The Bihar Police Written Exam will be of 100 Marks containing total 100 Questions. One mark will be given for each correct answer. Moreover, the duration of this examination will be for Two Hours. So, practice solving the model papers within 2 Hours. It will be helpful for you in finishing the exam within the given time. Questions in this examination will come from five subjects which are furnished beneath. General Science (Physics, Chemistry & Biology). Important Note: Candidates, who are going to appear in this exam, will also be thinking about the subject wise Bihar Constable Syllabus 2017. So, we inform to such runners that in this exam, the organization will ask Intermediate Level Questions from the above-mentioned subjects. So, you are necessitated to study for these subjects according to the syllabus of Intermediate Level for the same topics. This written examination is a qualifying examination which is required to be taken by all applicants in order to be eligible for the Physical Test. The final merit list of shortlisted contenders will not be based on the written examination but the candidates (All Categories), who don’t obtain minimum 30% marks, will be disqualified in this recruitment exam and the organization will not allow them to participate in the physical test. Queries on Bihar Police Constable Syllabus 2017 can be asked using the comment section (Given Beneath). As well as, you can also get the fastest updates on this exam with the help of our web portal.